Power Outages and Emergency Backup Generators. Several times during July I kept hearing and reading about power outages. First, I received an email from a lady in Wisconsin thanking us for our books and she mentioned, I found out the hard way about power outageswith thunderstorms raging outside, I couldnt do much except eat peanut butter and crackers and canned tuna. I didnt want to open the freezer and refrigerator until power was restored 16 hours later! That same day Annie was listening to The Weather Channel and they announced that FEMA (Federal Emergency Management Agency) was warning people to prepare for power outages, as the power companies arent able to keep up with demand. Then The Sunday Oklahoman had a front page article titled Storms set outages record (July 23, 2000). Storms in and around Oklahoma City had caused power outages that surpassed utility damage in the May 3, 1999, tornadoes (the big F5 tornado that hit Oklahoma City). In a previous newsletter article Ive discussed the basics of preparing for power outages (Are You Prepared for a Cold Winter and Power Outages?, Dec 96/Jan 97). This included having a workable flashlight handy, keeping warm (in cold weather), having an emergency supply of water and food, and communications (radio receiver). In this article I just barely touched on having a backup generator, but left the details for a more in-depth article. So the topic for this newsletter is emergency backup generators and what you need to know before purchasing and installing one. A backup generator is definitely not for everyone. If you live in the city, there may be laws prohibiting installing and operating a generator, and there are probably fire safety laws against storing fuel for the generator. So before purchasing a generator read this article and any others you can, then check out your citys ordinances and fire codes that might limit your use of a generator. When considering a generator, be aware that they are noisy, emit deadly carbon monoxide fumes, have to be properly installed and operated, and the fuel (gas, diesel, propane) is dangerous to store. in B&A Products warehouse. Large transfer switch installed into the wall of our home. 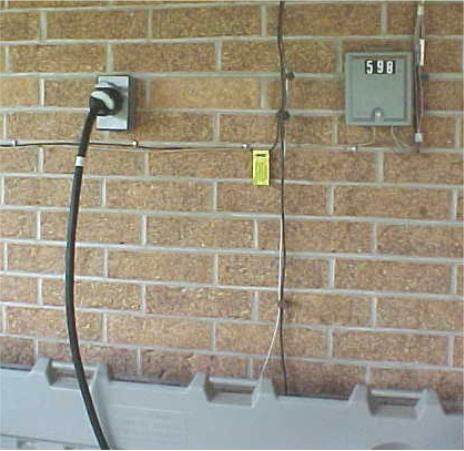 The cable to the main breaker box is in the wall and the cable to the generator goes out through the wall to a connector box on the outside of the house. 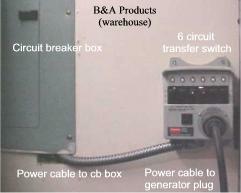 A generator that is connected to your household electrical system MUST be installed by a licensed electrician and have a special device called a TRANSFER SWITCH (see pictures) installed. The transfer switch is a heavy duty, double-pole switch, that disconnects your utility power when using the generator, and connects the generator power to your electrical system. Without this device there is a serious danger that electricity output by the generator would feed back into the power distribution system (the high-line wires), killing or injuring a repairman or anyone else that comes into contact with the power lines. A temporary, portable generator does not require a transfer switch, but should NEVER be directly connected into your homes electrical system. There is a tendency to want to just plug the generator into a handy outlet to power your houseWRONG! A portable generator is used where the device requiring electricity is plugged directly into the generators power outlets using an extension cord. This should be a heavy-duty extension cord, definitely NOT a small, cheap, two-wire lamp cord. I mentioned the use of the extension cord, because the generator must be located outside the house to operate. Remember, generators emit deadly carbon monoxide and must be situated outside the house where there is adequate ventilation. In selecting a generator there are several issues to consider. One is power output, rated in watts or kilowatts (kw, meaning a thousand watts). Another is the fuel to power the generator, normally gasoline, diesel, propane, or natural gas. Another factor is the time the unit will run from one tank of fuel. And whether the unit is powered started from a battery, or uses a pull-cord to be manually started. 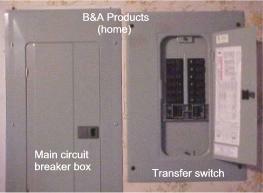 Similarly a transfer switch can be automatic or manually switched. Generators are available in power output ranges, from a small 800-watt unit with handles, to huge units to power a hospital during a power outage (1500 kilowatt or more). An 800-watt unit would be capable of powering eight 100-watt light bulbs, or equivalent, at one time. A popular size generator that is readily available from Sams, Sears, Home Depot, and such, is a unit built in a metal frame with power output of 4500 to 5000 watts (4.5 to 5 kw). This is what we have installed, and it is capable of powering the critical appliances in our house. We cant run the air conditioner, heater, or electric stovethey draw too much power for our 5 kw gasoline generator. We can power most of our lights, refrigerator and freezer, microwave oven, and it will operate our 240-volt water well pump. When we are using it, we try to keep power consumption to a minimum by not turning on lights and appliances when they are not needed. To exceed the 5000 watts rating would pop the generators circuit breaker at best, or possibly damage the generator. Determining how big a generator you need can be done by adding up the wattages required by every device you want turned on at one time. This can be a little tricky, in that some appliances and devices cycle on and off, as needed; as an example, a well pump or refrigerator motor. And there are many devices in a normal home that tend to get overlooked: like clocks, devices that use plug-in transformers and power supplies, and devices like modern TVs with remotes that use a small amount of power, even when they are supposedly off. To determine how much power (wattage) a device uses, check the appliances labels or the owners manual. Generators that operate from gasoline are the least expensive, but are louder, and wear out faster than diesel, propane, or natural gas generators. However, the diesel, propane, and natural gas generators are a lot more expensive than gasoline driven generators. Our 5 kw gasoline generator will run about 5 hours from a full tank of gas. When you suspect the gas is about to run out, go ahead and power everything in the house off, shut off the generator and let it cool down before refilling the tank with gas. Gasoline spilt on a hot generator engine could start a fire and/or explodenot a good situation! When you get a generator, read the owners manual carefully in regard to operating and maintaining the generator. The owners manual will probably suggest you drain the gas tank when not using the generator for long periods of time; and/or to shut off the gas line valve and run it until it stops, to empty the gas from inside the engine. Note: you can leave gas in the tank if you use a gasoline stabilizer (like PRI-G) to make sure the gas doesnt gum up inside the generators gas tank. One other suggestion, when running a generator unattended outside, you might want to get a heavy chain and lock and secure it where it cant easily be stolen. Generator theft was popular during the long power outage in Montreal, Canada a few years ago. Theres probably more that could be said, but this should give you some idea what is involved in selecting, purchasing, installing, and using an emergency backup generator. The pictures below show our 5-kw generator installation for our home. 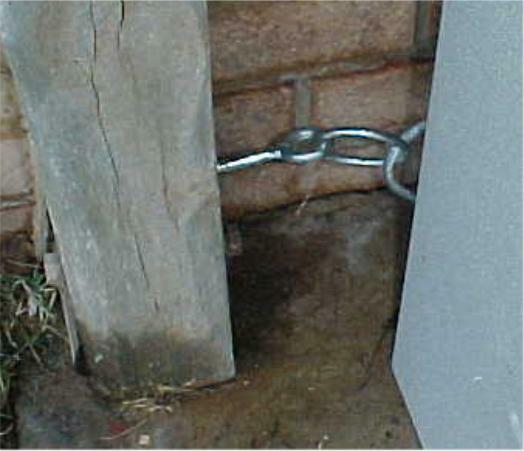 It sits on our carport, housed in a Rubbermaid storage shed (#3753), that is pad-locked on the top. When closed you can't tell there is a generator inside and it is secured by a strong metal cable that goes around the frame of the generator (picture 5) and into an eye bolt screwed into a beam of the house (picture 4). 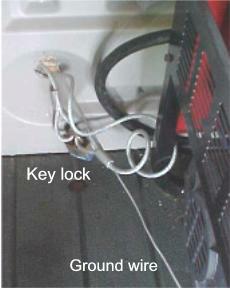 A Masterlock pad-lock (inside the enclosure) closes the loop and can be unlocked as needed. The generator power cable plugs into the 240-volt twist-lock socket (picture 3). This connects to the transfer switch inside the house (see transfer switch picture above). This picture also shows the utility service ground wire, which we attached the generator's ground wire to (picture 5), using a copper wire lug connector. 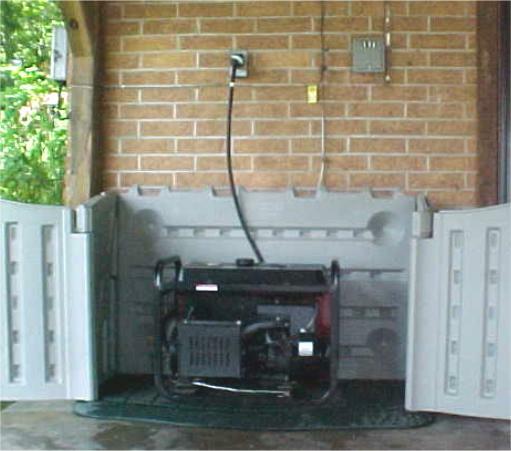 When operating the generator, the enclosure is fully open and the top panels and doors are normally removed. The generator is started by a pull cord on the right side of the generator. Here's a useful article: Installing a Backup Generator (Popular Mechnics March 1998). This one has more information about installing a transfer switch and hooking up the generator.